Colin’s angelfish larvae (Centropyge colini) were raised from captive-spawned eggs at 77-79F on wild copepods and artemia. First record of Colin’s angelfish culture. Colin’s angelfish is known from Cocos-Keeling Island in the Indian Ocean, Papua New Guinea, Palau, Guam and Fiji in the Western Pacific. It is considered a deepwater angelfish species, occurring at depths between 120 and 250 feet. Here it usually inhabits caves and reef cracks where it grazes on macroalgae. C. colini may also feed on sponges. CollectedC. 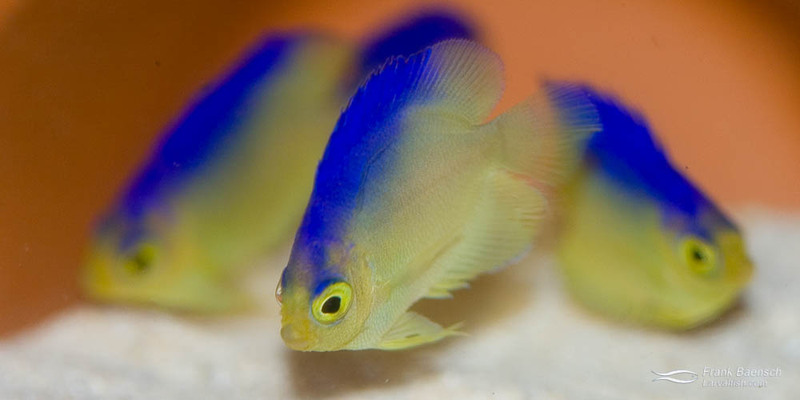 colini are delicate, secretive fish that often suffer from decompression related problems. As a resulted most specimens entering the trade perish in captivity. Left: A pair of Colin’s Angelfish. Right: 52-day-old juvenile Colin’s Angelfish. Captive-bred C. colini juveniles are far less secretive and timid than their wild-caught parent broodstock. They are curious, feed eagerly and get along well with each other as well as interruptus and multi-barred juveniles. Aquarium foods consist of high quality micropellets, artemia nauplii, grated gel diets, crushed flaked foods high in marine algae and occasional feedings of frozen cyclopeeze. This is a tropical species that should be kept between 76 and 84 degrees Fahrenheit. Centropyge larval species are usually quite difficult to distinguish prior to becoming post-larvae. C. colini is the only species I have worked on that develops long ray extensions on each pelvic fin early in the larval phase. Right: A 25 day old Colin’s Angelfish larva (note the pelvic fin extensions). Left: A 24 day old Japanese Pygmy Angelfish larva.